Russian Aircraft Corporation MiG has been knocked out of the competition for an extremely important $10.5 billion contract to supply 126 fighter planes to India. It is heading for a takeover by Sukhoi. Of the six companies that bid to supply fighter planes for the Indian Air Force, two made the short list, the French Dassault with its Rafale fighter plane and EADS with its Eurofighter Typhoon, Indian Defence Ministry Spokesman Shudan Shukar, told Vedomosti yesterday. He did not say when the winner would be announced. MiG is part of the United Aircraft Corporation (UAC) and one of the oldest developers and producers of warplanes in Russia. It has its design office in Moscow and plants in Lukhovitsy and Nizhny Novgorod. Its flagship product is the MiG-29 fighter of which more than 1600 have been built since 1982. The tender was critical for RAC MiG. A win would have opened up long-term prospects for the company in the Indian market. However, even after the lose it still has things to do, first and foremost constructing carrier-based planes, said Igor Korotchenko, Director of the World Arms Trade Analysis Centre. MiG has a 400m euro contract with Myanmar to supply 20 MiG-29s to be fulfilled within a year, a $1.3 billion contract with India to deliver 29 carrier-based MiG-29K/KUB (until 2016), a contract to modernise 62 Indian MiG-29s (until 2015) and a contract with Syria for twenty-four MiG-29M/M2 (worth about $1 billion), according to a high-ranking source at the Russian Defence Ministry. True, the last of the contracts named may face problems due to unrest in Syria, the source notes. The Russian state armaments programme until 2020 includes the procurement of 26 carrier-based MiG-29s and at least 72 MiG-35s, but contracts have yet to be signed, a Defence Ministry official says. According to RAC MiG spokeswoman Yelena Fyodorova, the company has ambitious plans to build carrier-based MiG-29K fighters and its modifications. Some long-term plans for the Russian Defence Ministry exist, but it is too early to speak about them. According to the latest published reports, in 2009 RAC MiG earned 24.8 billion roubles, which means a net loss of 7.9 billion roubles, and its debt by mid-year was estimated at 44 billion roubles. That year Algeria scrapped a contract to buy 34 MiG-29s, which were then bought by the Russian Air Force. In addition, MiG received a 30 billion rouble state subsidy, bringing the total state bailout package to 47 billion roubles. There is a high probability that in the next 5–10 years MiG will merge with Sukhoi, according to Konstantin Makienko of the Strategies and Technologies Analysis Centre. In the next ten years the company will mainly continue building carrier-based MiG-29s and others based on it. 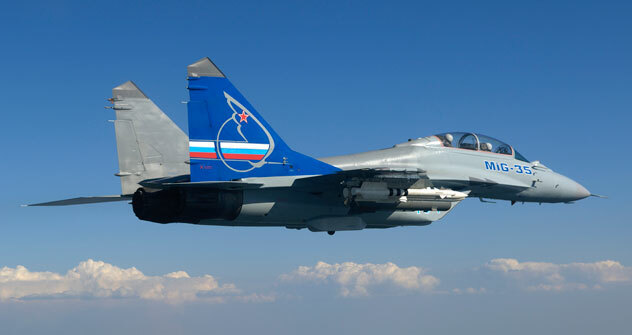 After 2015 Sukhoi is expected to take over MiG, an UAC manager said. A MiG declined to comment. The Indian Defence Ministry’s decision is very important for the whole world market, Mr Makienko went on to way. It rejected the technically most sophisticated American fighters, dealt a blow to the Sewdish Gripen. In the run-off Eurofighter Typhoon has a better chance, he noted. If that happens the French Rafale will suffer another blow as it has not yet landed a single export order.